Microsoft plans to unveil its next-generation three-dimensional experience sometime this year, and two Billings high school graduates left their mark on the project. The HoloLens uses three microprocessors and a series of mirrors to project holograms into its user’s eye. The result is high definition interactive imagery that can be adapted for entertainment, educational, industrial and military purposes. The device is worn on the head like goggles and resembles the virtual reality units that were released in the past year. But there is a big difference. The HoloLens provides a mixed reality experience. The holographic images are projected onto the user’s real surroundings. Xray, a game offered on the platform, births robots from real walls, and the user is challenged to shoot and dodge the machines. Because nearby objects are still visible, the person wearing the device isn’t confined to a chair. They can move through the projection and interact with the holographs without fear of running into a room’s contents or barriers. 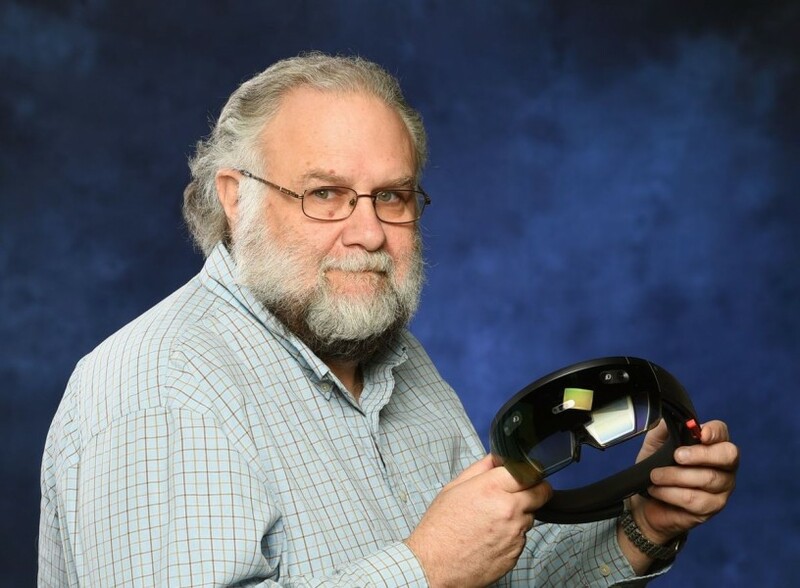 David Hyams, a 1975 graduate of Billings Central High School, is one of the founders of Seattle-based robotics company CoroWare and worked on contract with Microsoft as part of the HoloLens program. Hyams left the firm to return to Billings last year but continues to develop applications ahead of the unit’s release. The HoloLens is currently available only to developers and carries a $3,000 price tag. The suggested retail price is expected to be lower but has not been released. Hyams said the core HoloLens development team started working on the project after bringing Microsoft’s Xbox Kinect to market. The Kinect added a motion-sensing camera to the video game console that allowed gamers to ditch controllers and enjoy more dynamic gameplay. For example, a bowling game called for a player to mimic the motions of the actual sport instead of pushing buttons to release the ball. The HoloLens pushes the realism further. “Not only does it free you from a TV and a Kinect sensor, it gives you three-dimensional characters,” Hyams said. There are already hundreds of applications developed for the HoloLens. Some are adapted from other platforms like Skype and web browsers. Others are new and designed around the new capabilities the HoloLens offers. These include video games and immersive tours of exotic locations around the globe. A student will be able to explore the mountains of Peru after just a few minutes of familiarization with the HoloLens controls, a combination of voice commands and hand motions. Hyams played a part developing technology that can transform any room into a space thousands of miles away. But he hopes it will also help Montana’s young people find meaningful work locally. “My whole path came from graduating from Billings Central in 1975, working to get into technology and software, and realizing I had to go somewhere else,” he said. As a high school student he worked nights at the now defunct Western Film on South 29th Street and became fascinated by the increasingly automated film processing equipment. He also found inspiration in his hobbies. “What kind of access to electronics do you have when you’re 16, 17 years old? There’s TV and stereos. I wanted to learn how they worked,” Hyams said. At the time electronics were transitioning from analog to digital. Computer processors allowed for software changes creating the possibility to transform the way a machine operated without changing its hardware. It was a period of revolution but the frontline was far from Billings. He attended Devry Universtiy in Phoenix before taking a job with Kodak in Silicon Valley. The tech industry was just beginning to boom in the San Francisco Bay Area. Hyams was exposed to a culture of innovation and started to see a wider array of professional possibilities. After spending years in software and hardware development he helped found the robotics firm CoroWare in the Seattle area. Hyams said a few hundred people were working on the HoloLens project when CoroWare became involved. Now there are thousands. Daryl Yourk, a 2009 graduate of Billings West High School, is one of them. Yourk began working at CoroWare as a robotics technician assembling electronics in 2012. He met Hyams when he was assigned to the HoloLens project and since then has transitioned to full-time employment as an IT operations manager with Microsoft. Yourk departed Montana a month after graduation to study at Lake Washington Institute of Technology in Kirkland, Washington. The move paid off with career opportunities like the CoroWare job and a limited position operating the timing system with Rally America, where he met childhood idols and action sport legends Travis Pastrana, Ken Block, Dave Mirra and Bucky Lasek. Yourk said those experiences would have been impossible in Montana and his salary would be halved by a move home. But he still thinks about it. Hyams and Yourk left Billings to chase a tech- driven dream about 35 years apart but after working together share a new goal: using the technology they helped develop to bring new opportunities to Montana. That means getting new gadgets in the hands of younger students. Through increased interest and education a growing workforce would emerge. Businesses would follow. Like Hyams, Yourk’s interest in technology was piqued by the entertainment-focused electronics of his youth. Hyams had stereos and Yourk was a member of the Magic City Remote Controlled Car Club. But the next generation could find their way to a tech job through the HoloLens.